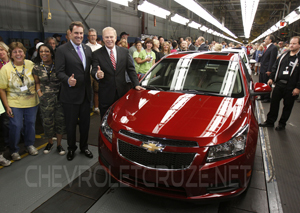 Production of Chevrolet Cruze Begins in Lordstown as of today! Chevrolet Cruze Sound Testing. Video shows how quiet Chevrolet Cruze really is! Check out this video of a technician sound testing the Chevrolet Cruze! In this video it shows how quiet the cabin of the Chevrolet Cruze truly is! With the latest technology in sound deadening technology.... denim? Good to see old jeans put to good use! You can hear as the windows are up, it is next to silent to the loud band playing! Truly awesome. The ads will mainly be focused on the quality of the Chevrolet Cruze and highlight it's interior features. This will be endorsed by media related comments regarding how the Chevrolet Cruze outmatches its competitors. GM announced yesterday that they will be launching a new 5-door hatchback model of the Chevrolet Cruze. The Chevrolet Cruze hatchback will be available across Europe mid 2011 and will follow in the global markets shortly after. Even though the Chevrolet Cruze Sedan is due to arrive into the US market in September, the hatchback version will not be available in the US market. The Chevrolet Cruze Hatchback will make its debut at Paris Motor Show on September 30th, 2010. In my opinion, it sounds like GM is trying to compete with Mazda 3, which has dominated the market in recent years (at least in Canada) for the sports compact market. They should consider launching the Chevrolet Cruze SS which would threaten Ford & Mazda as direct competition. You can still have good power/performance and amazing mileage with boosted motors, just look at Ford’s Eco-Boost engines. Also, the hatch looks awesome, I’m willing to put my money on it in a couple of years, the demand will be in North America for GM to make the hatch available for the US/Canadian market. Attached is two more pictures of the awesome looking Cruze Hatchback! All Cruze assembly lines WILL be full beginning this Tuesday. 1,000 units have been built to date and those will be bayed and loaded to leave for their new homes starting today (Sat.) and Sunday. Dealerships should be receiving a list of trim levels, orderable options and other info. this week. It appears most dealerships initial shipment (the above 1,000 units) are referred to as "pattern" cars. The dealer requests the car and is alloted a certain amount by total sales, but has no real control over color or options on the first limited batch. But am sure the big dealers with clout gets a liitle more of what they want! Attached a pic of artist's rendition of a Cruze SS Coupe! Click to enlarge. That's it for now.... Will keep you updated!! As of September 2, 2010... The Lordstown facility is not close to full production at all, despite the car going on sale this Tuesday. Only 150 units are being produced daily! Why?? They want it RIGHT!!! The RS (not SS) model will not be available until possibly late October, but in "GM speak", I'm figuring November at best. There are no major issues with the RS except issues arising regarding the side ground effects to fit perfectly where the fender, door and rocker panels meet. The goal is "no gaps" and anything other than that is not acceptable and not to be released for sale. Also the original badging slated for the RS was recently scratched and a new design in the works now. Don't know if it was a quality issue with that decision or aesthetics. As of today, 200,000 orders have been placed and on file to build. This includes dealer stock and sold orders! Not sure if that includes any fleet sales if any, so far. That is the "news in a nutshell" this week! Will try to keep you up with the happenings.... as they happen!!!! Welcome to ChevroletCruze.net! Chevrolet Cruze Owner's # 1 & only resource! Welcome to the best Chevrolet Cruze site on the net! If you have not registered yet, please do and log-in/post to talk with other Chevrolet Cruze owners! Visit the forum home by clicking here.